2 BR 1 BA, 14x47, manufactured home downtown Myrtle Beach, walk to the beach, only 1 1/2 blocks from South Ocean Blvd. If you've been looking for a beach home this is it, two bedrooms, large living room, table space kitchen with a breakfast bar and it comes completely furnished, everything stays, including all the beautiful wall treatments, beds, linens, stove, refrigerator, dish washer, microwave, dishes, pots/pans, stainless ware. This is turn key, just bring your clothes. Many improvements and upgrades, new a/c & heat Aug 2018; plus during last 4 yrs, new vinyl skirting, vinyl flooring in both bed rms, hall, & bath, ceramic tile shower walls, ceiling fans & lighting, refrigerator, dryer, outdoor furniture, & fresh paint inside. 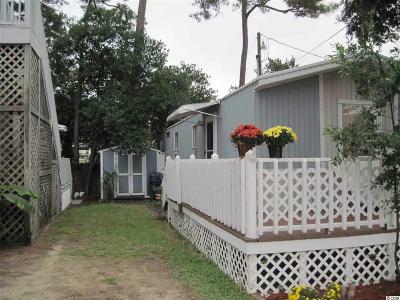 Also has 2 large decks & an outside storage shed. This is a solid home in great condition, won't last long call today to see.